Born and raised in Bozeman, Montana, Jennifer Grace trained at The Dance Center in Bozeman, The Bolshoi Ballet Academy in Moscow, Russia, and Dmitri Kulev Classical Ballet Academy in Southern California. 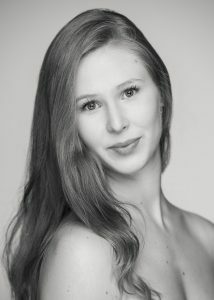 She joined Tulsa Ballet II in 2013 and was promoted to Corps de Ballet only three months later. She was promoted to Soloist in 2018. Her repertoire includes Hermia and Titania in A Midsummer Night’s Dream (Wheeldon), Fairy Godmother in Cinderella (Stevenson), Marie in The Nutcracker (Angelini), Lilac Fairy and Aurora in The Sleeping Beauty (Angelini), Mercedes and The Queen of the Dryads in Don Quixote (Holmes), Serenade (Balanchine), and the “Man I Love” pas de deux in Strictly Gershwin (Deane). She has also worked with choreographers such as Ashley Page, Adam Hougland, Young Soon Hue, Ma Cong, Alejandro Cerrudo, and Luciano Cannito. Some of her contemporary repertoire includes In the Middle Somewhat Elevated (Forsythe), Rassemblement and Remansos (Duato), Infra (McGregor), and Age of Innocence (Liang), among others.